Outstanding copy is one of the best ways to earn higher conversion rates, but it isn’t always easy to produce and, while the internet is full of writing advice, much of it is not very helpful. While grammar and punctuation can be important aspects of a good copy, they are not the most important factors to consider. In fact, there are only four rules for great, high-converting copy. The absolute most important factor in the success of your copy is clarity. Everything else comes second. After all, if your customers cannot understand what you are trying to sell them or why your offerings are better than those of your competitor, no amount of humor is going to win them over. Don’t worry about your content reading funny or cute: as long as your message is clear and concise, your copy has done its job. In some cases this might mean that the most highly-converting copy for your products is boring and that is fine as long as it is easily understood and specific. Formal copy often ends up sounding stuffy, boring, and unenthusiastic, so keep things casual. Nobody wants to read copy that sounds like an essay they wrote in school, but avoiding that formal style of writing can be a real challenge for many of us. If you are having a hard time breaking out of formal writing styles, try dictating your copy instead of writing it. Speak as if you were describing the product to a friend and don’t be afraid to use expressions, colloquialisms, and slang where appropriate. Talk directly to the reader and refer to them as “you” in order to get them more involved in what you are telling them. Internet readers tend not to read an entire page from top to bottom. Instead, most of us scan for information, our eyes flitting from headline to headline and bullet point to bullet point. Up to 80% of the visitors to your website will only read the headlines unless you are able to grab their attention. Increase readability and give yourself multiple chances to catch their eye by breaking up your content with strong, succinct headlines that get noticed and understood easily. 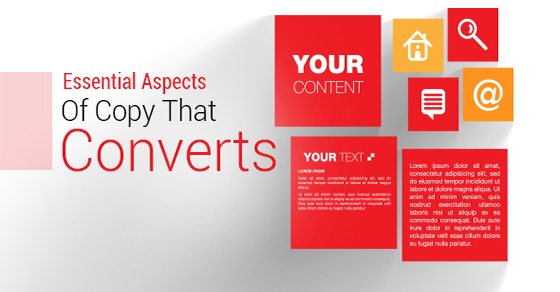 Back up each headline with clear, relevant content and you will see noticeable improvements in conversion. Many people will simply skip long words that they do not understand, dropping to the next line of text or giving up entirely. Don’t alienate your visitors by using big words that are outside their range of experience and avoid using words over three syllables or ten letters unless they are particularly familiar or relevant to your topic. Similar to big words, long sentences have a tendency to make readers tune out. Anything longer than about 15 words many become more difficult to understand when read or scanned quickly. These sentences may drive your customers away or prevent understanding of your message and products. The best sentences are easy to understand and short; usually containing about 10-15 words. They will also typically follow the format of subject-verb-direct object in order to maintain simplicity of understanding. Pictures can be just as important as copy in the write situation. They provide a natural way to break up the content and give the eyes a break from interpreting text. Copy that includes relevant and well placed visuals in much more likely to have high conversation rates than copy that is all text. Short, powerful, direct, and easy to scan, bulleted or numbered lists are one of the best ways to draw attention to the most important features of your product and they can be used just about anywhere. Carefully spaced blocks of text with concise headlines and subheads grab the attention of readers. A bolded headline with image and a short blurb of text is much easier for a reader to interpret, understand, and engage with than paragraph after paragraph of plain text. While there is no magic ratio of copy to white space it is a well-known fact that white space can be a powerful aspect of good design. Typically, the more white space the better as the most important factor is how well the reader can follow the progress of the content. With more white space, the reader is naturally drawn to the text and images and their attention is more focused than if they were looking at a busy, crowded page. Most readers will see some words and not others. The best copywriters know how to use the most important words in the places where they will be seen and absorbed. If the user is engaged, they will pick up on these key words right away, especially if they are bold faced, underlined, highlighted, italicized, printed in a different color, in a headline, or placed at the beginning or end of a sentence. They will also be more noticeable in a bulleted or numbered list. Improving the quality of the copy on your website can make a huge difference in conversion rates and it is not a complicated science. Simply remember to keep it clear, casual, and scannable with lots of great headlines and you are sure to see a marked improvement. Using a professional theme also has a big impact on visitors to trust and share the contents.